This page is about the food. For the English philosopher and statesman, see Francis Bacon. Bacon is a meat product prepared from cured pork. It is first cured using large quantities of salt, either a brine or a dry packing. Fresh bacon may then be dried for weeks or months in cold air, or it may be boiled or smoked. 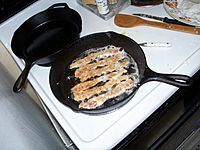 Fresh and dried bacon are typically cooked before eating, often by pan frying. Boiled bacon is ready to eat, as is some smoked bacon, but they may be cooked further before eating. Bacon is prepared from several different cuts of meat. It can be made from the pork belly or from back cuts, which has less fat than the belly. Bacon may be eaten smoked, boiled, fried, baked, or grilled. It is eaten on its own, as a side dish (particularly in breakfasts), or used as a minor ingredient to flavour dishes (e.g., the club sandwich). Bacon is also used for barding and larding roasts, especially game, including venison and pheasant. The word is derived from the Old High German bacho, meaning "buttock", "ham" or "side of bacon", and is cognate with the Old French bacon. 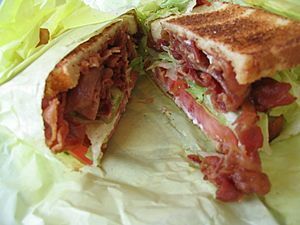 Meat from other animals, such as beef, lamb, chicken, goat, or turkey, may also be cut, cured, or otherwise prepared to resemble bacon, and may even be referred to as "bacon". Such use is common in areas with significant Jewish and Muslim populations, both of which prohibit the consumption of pigs. For safety, bacon may be treated to prevent trichinosis, caused by Trichinella, a parasitic roundworm which can be destroyed by heating, freezing, drying, or smoking. Bacon is cured through either a process of injecting with or soaking in brine or using plain salt (dry curing). In America, bacon is usually cured and smoked, and different flavours can be achieved by using various types of wood, or rarely corn cobs; peat is sometimes used in the United Kingdom. This process can take up to eighteen hours, depending on the intensity of the flavour desired. The Virginia Housewife (1824), thought to be one of the earliest American cookbooks, gives no indication that bacon is ever not smoked, though it gives no advice on flavouring, noting only that care should be taken lest the fire get too hot. In early American history, the preparation and smoking of bacon (like the making of sausage) seems to have been a gender-neutral process, one of the few food-preparation processes not divided by gender. 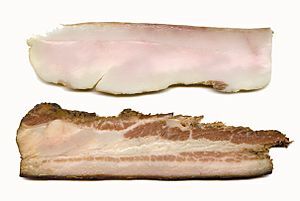 In the United Kingdom and Ireland, smoked and unsmoked varieties are equally common, unsmoked being referred to as "green bacon". Bacon is distinguished from salt pork and ham by differences in the brine or dry packing. Bacon brine has added curing ingredients, most notably sodium nitrite, and occasionally potassium nitrate (saltpeter), but sodium ascorbate or erythorbate may also be added to accelerate curing and stabilise colour. 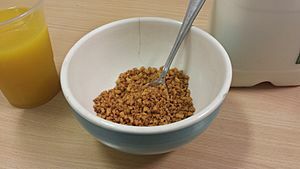 Flavourings such as brown sugar or maple syrup are used for some bacon products. Sodium polyphosphates, such as sodium triphosphate, may also be added to make the product easier to slice and to reduce spattering when the bacon is pan-fried. Today, a brine specifically for ham includes a large amount of sugar. Historically, the terms "ham" and "bacon" referred to different cuts of meat that were brined or packed identically, often together in the same barrel. Side bacon, or streaky bacon, comes from pork belly. It is very fatty with long layers of fat running parallel to the rind. This is the most common form of bacon in the United States. "Slab bacon" is side bacon that is not sliced. Slab bacon is similar to salt pork, which is prepared from the same cuts, but salt pork is not smoked. Pancetta is Italian streaky bacon, smoked or aqua (unsmoked), with a strong flavour. It is generally rolled up into cylinders after curing. Back bacon contains meat from the loin in the middle of the back of the pig. It is a very lean, meaty cut of bacon, with less fat compared to other cuts. Most bacon consumed in the United Kingdom and Ireland is back bacon. Different cuts of pork are used for making bacon depending on local preferences. In the United Kingdom and Ireland, back bacon is most common. In the United States, the plain term implies belly bacon, with back cuts known as "Canadian bacon". 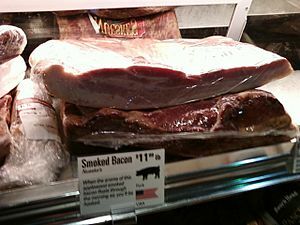 The USDA defines bacon as "the cured belly of a swine carcass", and other cuts and characteristics must be separately qualified (e.g., "smoked pork loin bacon"). Bacon is often served with eggs and sausages as part of a full breakfast. Historically, the skin left on the cut is known as 'bacon rind', but rindless bacon is also common throughout the English-speaking world. The meat may be bought smoked or unsmoked. The most common form sold is 'middle bacon', which includes the more of the streaky, fatty section of side bacon along with a portion of the loin of back bacon. In response to increasing consumer diet-consciousness, some supermarkets also offer the loin section only. This is sold as 'short cut bacon' and is usually priced slightly higher than middle bacon. Both varieties are usually available with the rind removed. The term 'bacon' on its own typically refers to side bacon. 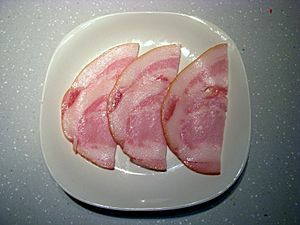 'Back bacon' refers to either smoked or unsmoked bacon cut from the boneless eye of pork loin; this is called 'Canadian bacon' in the United States when cut into a thick medallion shape. Peameal bacon is back bacon, brined and coated in fine cornmeal (historically, it was rolled in a meal made from ground dried peas). Bacon is often eaten in breakfasts, such as with cooked eggs or pancakes. In Japan, bacon (ベーコン) is pronounced "bēkon". It is cured and smoked belly meat as in the US, and is sold in either regular or half-length sizes. Bacon in Japan is different from that in the US in that the meat is not sold raw, but is processed, precooked and has a ham-like consistency when cooked. Uncured belly rashers, known as bara (バラ), are very popular in Japan and are used in a variety of dishes (e.g. yakitori and yakiniku). The term 'bacon' on its own does not specify the cut but typically refers to back bacon. Bacon from the pork belly, with streaks of meat and fat, is referred to as 'streaky bacon'. Bacon from the back of the pig is referred to as 'back bacon', and usually includes a streaky bit and a lean oval from the loin. Middle cuts with an eye of meat and an extended streaky section are common. Heavily trimmed back cuts which may consist of just the eye of meat are available. Bacon may be cured in several ways; in particular it may be described as smoked or unsmoked. Many ways of curing add water to the meat; bacon sold as "dry cured" does not have added water. For example, in a shop a particular type may be described as "dry-cured unsmoked back bacon". Fried or grilled bacon rashers are included in the traditional full breakfast, which varies slightly from country to country ("full Scottish", etc.). A side of unsliced bacon is known as a 'slab'. An individual slice of bacon is known as a 'slice' or 'strip'. 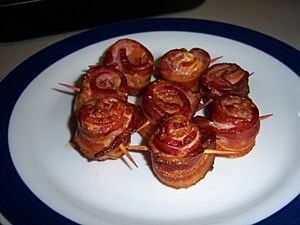 American bacons include varieties smoked with hickory, mesquite or applewood and flavourings such as chili pepper, maple, brown sugar, honey, or molasses. The term "bacon" on its own generally refers to strip bacon from the belly meat of the pig, which is the most popular type of bacon sold in the US. 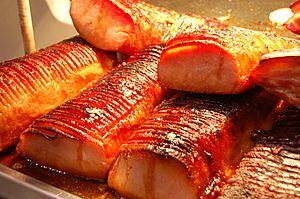 "Canadian bacon" or "Canadian-style bacon" is made from the pork loin, and is usually sold thick-sliced and pre-cooked. Bacon fat liquefies and becomes bacon dripping when it is heated. Once cool, it firms into lard if from uncured meat, or rendered bacon fat if from cured meat. 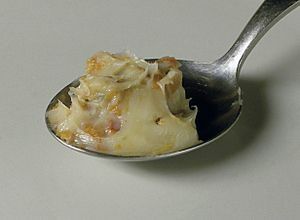 Bacon fat is flavourful and is used for various cooking purposes. Traditionally, bacon grease is saved in British and southern US cuisine, and used as a base for cooking and as an all-purpose flavouring, for everything from gravy to cornbread to salad dressing. 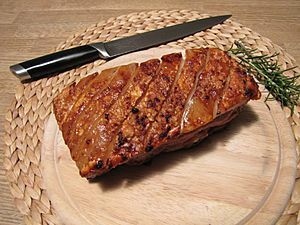 If streaky pork belly bacon sliced in cubes is being used for lard preparation, as traditionally in Germany, the parts with higher melting temperatures are roasted and stay in the lard. 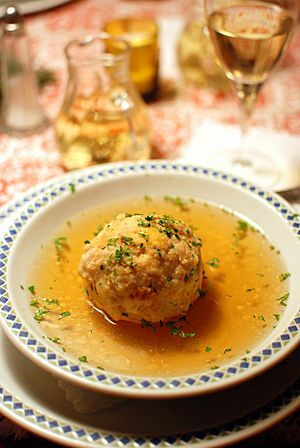 The result is Griebenschmalz, a famous spread. Bacon, or bacon fat, is often used for barding roast fowl and game birds, especially those that have little fat themselves. Barding consists of laying rashers of bacon or other fats over a roast; a variation is the traditional method of preparing filet mignon of beef, which is wrapped in rashers of bacon before cooking. The bacon itself may afterwards be discarded or served to eat, like cracklings. One 20-gram (0.7 oz) rasher of cooked streaky bacon contains 5.4 grams (0.19 oz) of fat, and 4.4 grams (0.16 oz) of protein. Four pieces of bacon can also contain up to 800 mg of sodium, which is roughly equivalent to 1.92 grams of salt. The fat and protein content varies depending on the cut and cooking method. 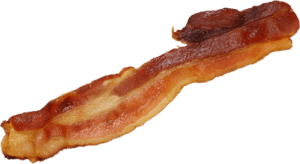 68% of the food energy of bacon comes from fat, almost half of which is saturated. Each ounce of bacon contains 30 milligrams of cholesterol (0.1%). Bacon has a large amount of sodium, and the consumption of a large amount of sodium has traditionally been considered to put a person at risk for heart disease and high blood pressure. Bacon is considered by many doctors to be unhealthy if eaten in excess. Researchers from the Harvard School of Public Health found in 2010 that eating processed meats (such as bacon) that are preserved by smoking, curing or salting, or with the addition of chemical preservatives, was associated with an increased risk of both heart disease and diabetes. Macon is another alternative to bacon, produced by curing cuts of mutton in a manner similar to the production of pork bacon. Historically produced in Scotland, it was introduced across Britain during World War II as a consequence of rationing. 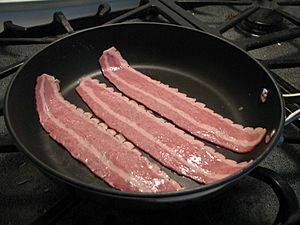 It is today available as an alternative to bacon, produced for the Muslim market and sold at halal butchers; it is largely similar in appearance to pork bacon except for the colour (which tends to be black and yellow). Vegetarian bacon, also referred to as fakon, veggie bacon, or vacon, is a product marketed as a bacon alternative that is available in supermarkets. It has no cholesterol, is low in fat, and contains large amounts of protein and fibre. Two slices contain about 74 calories. Vegetarian bacon is usually made from marinated strips of tofu or tempeh. Bacon Facts for Kids. Kiddle Encyclopedia.